Residents of the Lathrop Homes public housing community and their advocates marched through their community recently to get the Chicago Housing Authority to open up the large number of vacant units in the development to people in need of affordable housing. Cathy Johnson, a homeless mother of four, urging the CHA to have compassion on the homeless and open vacant units to those in need during a protest and rally at the Lathrop Homes in October 2008. “Keeping these units empty, in the midst of a housing crisis, is a terrible waste,” declared Cynthia Scott, a member of the Lathrop Leadership Team, during the press conference that followed the Oct. 23 march and rally. Lathrop Homes is the future site of a new mixed income community along the Chicago River, according to the CHA Board approved FY2008 Moving To Work Annual Plan. Redevelopment plans of Lathrop Homes calls for a total of 1,200 units, divided equally into public housing units, affordable units, and market-rate units, according to the MTW plan. 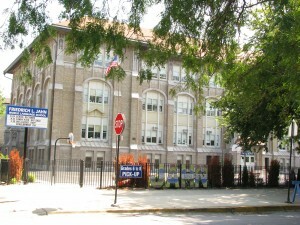 The MTW plan also states that the , “CHA intends to negotiate a Memorandum of Agreement (MOA) with the Illinois State Historic Preservation Office, convene working group meetings, and finalize a request for proposal for the redevelopment of Lathrop Homes in accordance with the MOA provisions,” sometime in 2008. On Wednesday, April 9, residents of Lathrop Homes experienced a major power outage which shut down electricity throughout the whole development and shut down most offices. Residents had lights out for days. U.S. Dwellings, the management company for Lathrop, put an emergency plan into effect. Lending a hand were Commonwealth Edison along with CHA representatives from headquarters. On April 17, there was a march to stop the violence in Lathrop Homes. The march took off from the Cotter Boys and Girls Club. In attendance were members of the Cotter Club as well as staff along with Local Advisory Council members as well as the CHA Service Connectors, members of the Tenant Patrol and staff of the DePaul University Urban Systems of Care, members of Chicago Alternative Policing Strategy and officers of the 19th District. I also wanted to see how management rates themselves. So I went into the developments and spoke with both. They got some reports of praise as well as some criticism. I also felt management did a good job the way they answered the questions that were put to them that came from residents as well as myself – speaking on how they operate in the development and how they would like to continue to operate. Let’s hear what everyone had to say. Robert is the newly elected Local Advisory Council vice president in Lathrop Homes. Robert has been involved in the community for the past 5 years and has been a member of the tenant patrol in the 26th Ward. He also serves as the area president where he lives and is involved with the 19th District Community Alternative Policing Strategy (CAPS) as well as the summer food program.